Today's So Shoe Me is the Tarou Sandal by Acne Studios, $670, available at Solestruck. 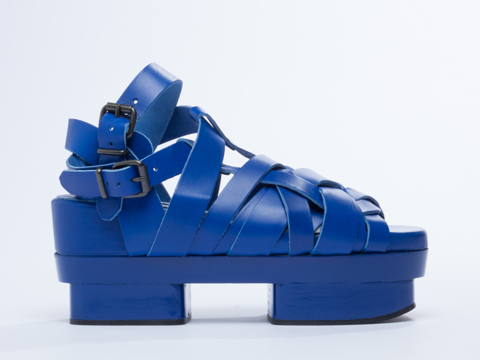 Slip into these strappy blue leather shoes by Acne Studios for a mix of Western Clog and Eastern Geta. The super saturated shade of cobalt blue adds a cool standout style with Acne's always modern aesthetic. Chunky twisted straps create a cool and current silhouette while the signature stilt platform adds a Japaneese Geta detail for an old meets new design. Pair these super blue sandals with a sequin shirt and shorts set and light blue lipstick for a mesmerizing mermaid look. So Shoe Me a pair of blue leather shoes with a strappy upper and signature shape that will add a bang to my basics this season.